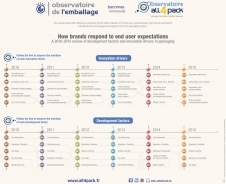 In alignment with the transformation of the trade shows EMBALLAGE and MANUTENTION and their change of denomination to ALL4PACK Paris, the Observatoire de l’Emballage (Packaging Observatory) has become the Observatoire ALL4PACK. Created in 2005 by EMBALLAGE, the Observatoire de l’Emballage each year aims to offer insight into this significant French economic sector, offering the entire industry (purchasers, manufacturers and distributors) a valuable chance to anticipate developments in packaging. In 2015, the Observatoire de l’Emballage celebrates its tenth anniversary and has changed its name to the Observatoire ALL4PACK, also including in its questionnaire several new topics reflecting the four complementary sectors of Packaging, Processing, Printing and Handling, with new subject matter suggested by ASLOG and CISMA, partners of the show. 10 years of macro-economic pointers by Annette Freidinger-Legay, International Packaging Expert and Consultant for ALL4PACK Paris. Build ties with the sector’s manufacturers. The only crossover analysis of the opinions of packaging users and purchasers, manufacturers of packaging/components and manufacturers of packing machinery and equipment. The result of an approach reviewed and adjusted every year so as to anticipate the changes in the packaging sector. The four charts appended below provide clear proof of the major trends which have marked this decade of the Observatoire de l’Emballage, and offer an outlook on the period from 2016 to 2018. Observatoire de l'Emballage celebrates its 10th anniversary. A snapshot of the industry in 10 key words. The Packaging industry displays its optimism! 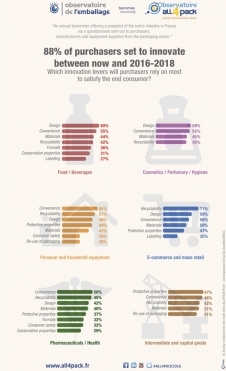 Which innovation levers will purchasers rely on most to satisfy the end consumer?